V.E.E.N. 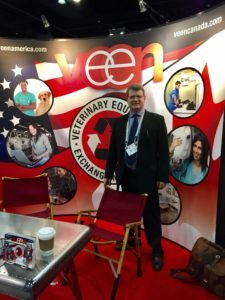 – Veterinary Equipment Exchange Network is a concept needed by veterinarians. Working with the community for over 35 years, has provided insight into the used vet equipment market. VEEN connects buyers and sellers of surplus veterinary equipment together. We provide a forum for veterinary clinics across North America to connect with each other, with all transactions brokered by VEENAmerica. VEENAmerica also arranges logistics, so items can be shipped all over the United States, Canada, as well as, international locations. This is the first North American, used veterinary equipment network of it’s kind, and has been successfully operating in Canada for over four years. VEENAmerica and VEENCanada are underwritten and managed by Canmedical (Canada), which was started in 1982. Our VEENAmerica introduction into the United States market, at the NAVC in Orlando, was a resounding success! Almost all of the veterinarians we spoke with at our booth had used vet equipment they were eager to find a new home for. We spoke to people who had stainless steel cages and kennels, used ultrasound machines, exam and surgery tables, anaesthetic machines, lasers, and so much more. We have been contacted by veterinarians that have whole clinics they are wanting to re-home. One veterinarian closed her equine clinic to open a feline practice. Another stopped boarding animals and has four clinics full of stainless steel cages. You should check out our website veencanada.com and veenamerica.com, and I’m sure you’ll be pleasantly surprised by all the various used vet equipment we can provide. Our next trade show is at the Western Veterinary Conference (WVC) in Las Vegas. We have a booth there and are excited to meet clinic owners, practice managers and technicians. Our booth number is 4738. Please stop by and visit us!!!!! Posted in Blog and tagged NAVC, Used Vet Equipment Exchange, Veterinary equipment, WVC.